Mostafa Elbermawy is a seasoned SaaS growth strategist. 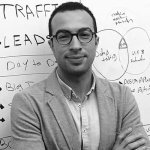 Over the past 9 years, Mostafa has helped brands such as American Express, P&G, and Workzone refine their growth marketing strategies and tactics. Mostafa is also a regular tech contributor for Wired and BBC Arabia. He currently heads marketing at Harver, a leading AI recruitment platform.